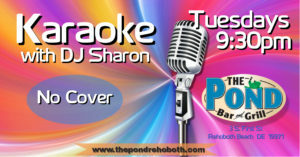 Tuesday Nights at The Pond are Karaoke Night, or as some prefer to call it, SCARYOKE Night. Either way, your sure to have fun with a song list of over 10,000 songs. So, get some courage (liquid or otherwise), select a song and SING Karoake. Do it for you, your friends and especially for complete strangers! !